it is wrapped twice around the pile. 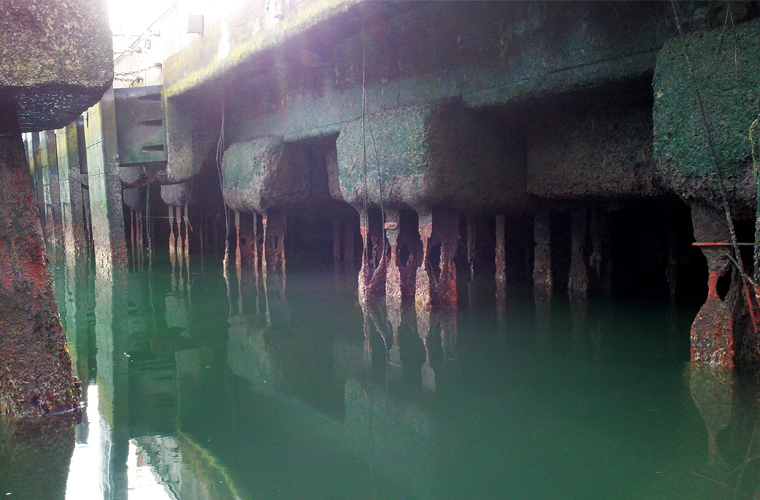 A large number of structures in coastal regions or crossing waterways are supported on piles. The harsh environment introduced by seawater, high humidity/high temperature, and wet-dry cycles causes rapid deterioration of these structures. The most severe conditions are found in the splash zone area which encompasses the portion of the pile between the low and high tide water levels. The high concentration of chloride ion in seawater allows it to penetrate and reach the steel even in high-quality concrete. As a result, the passive layer that normally protects steel is destroyed making corrosion of reinforcing or prestressing steel inevitable. When corroded steel expands it causes lateral forces on the surrounding concrete that far exceed the tensile strength of concrete. This results in cracking and spalling of the concrete cover. The deterioration of concrete and the loss of cross sectional area of the reinforcing steel results in reduction in capacity of the piles. Repairs often require creating a formwork around the pile and filling it with grout or concrete to enlarge the section, thereby increasing its load-carrying capacity. The wet marine environment combined with access difficulties are not suitable for use of formwork made with wood or steel. In the last forty years, Glass Fiber Reinforced Polymer (GFRP) jackets have become a material of choice for formwork in marine construction. 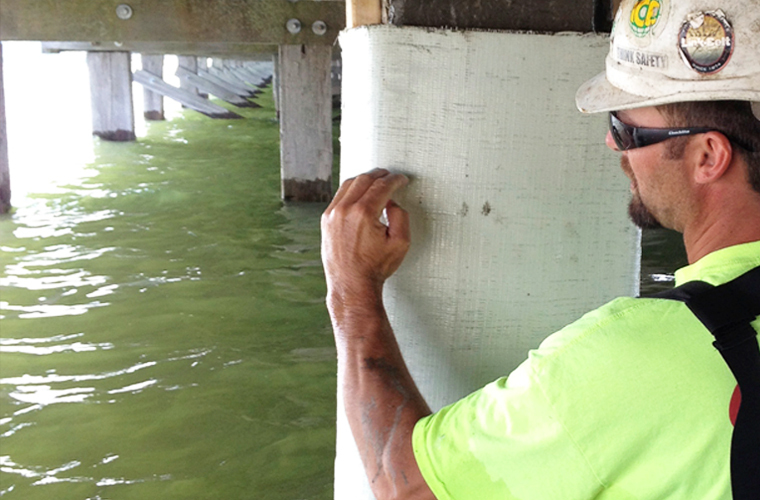 GFRP jackets are lightweight and moisture tolerant and have been used extensively for underwater pile repair worldwide. These products are typically constructed of two half shells made out of fiberglass that are bolted or glued together. Older pile jacket systems have either one or two weak seams along the height of the jacket that must be bolted or epoxied in the field. These seams introduce planes of weakness in the jacket. 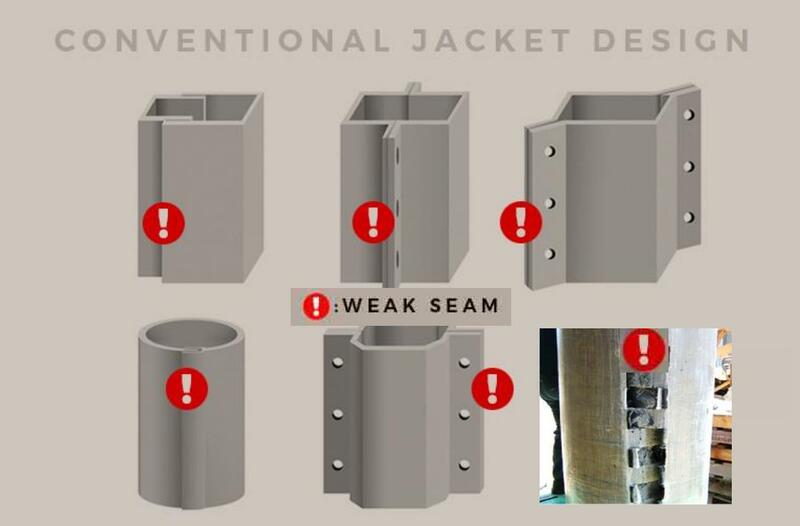 The strength of the fibers in a jacket cannot be developed to provide structural confinement when they terminate at a seam. Weak seams are also an entry point for water and oxygen to weaken the system overtime. Older pile jacket systems come in standard sizes. These standard sizes lead to larger annular spaces which add dead load to the host pile and increased grout costs and installation times. 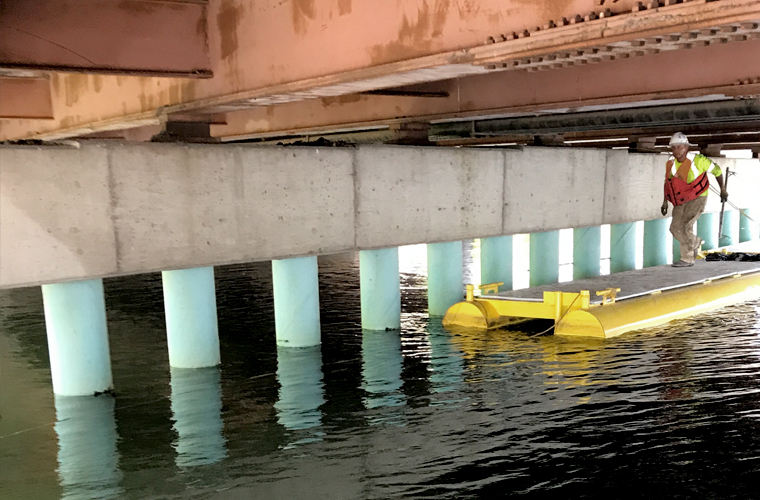 Professor Ehsani developed PileMedic® to be a structural strengthening system for piles that offers major advantages for both engineers and contractors. PileMedic® laminates contain fibers in two directions (longitudinal and transverse). 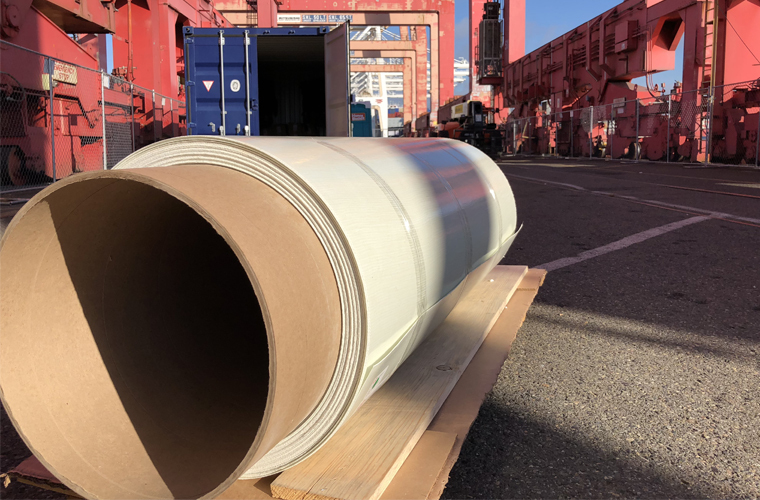 Pile jackets available in North America have tensile strengths between 15 - 20 ksi which is significantly lower than the 60 - 155 ksi strength offered by PileMedic®. When wrapped around a pile or column, the jacket creates a seamless shell around the column with tremendous confining pressure on the column. It is well known that the axial capacity of a column is proportional to the degree of confinement. 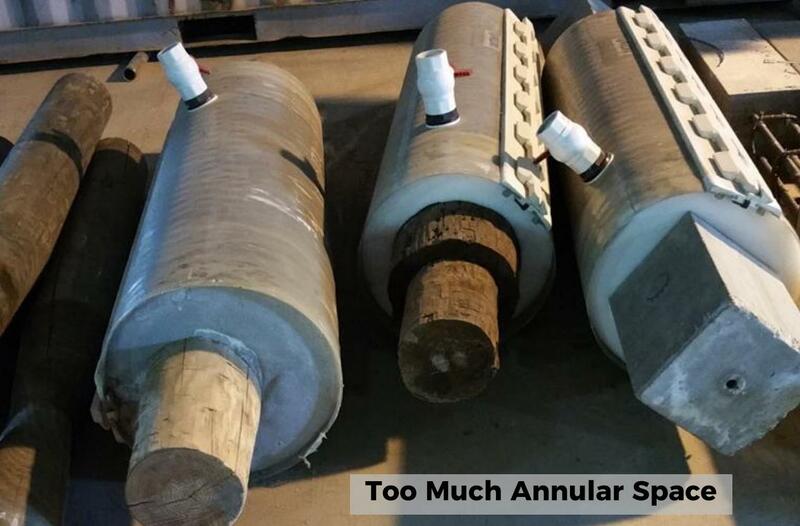 As an example, a 4000 psi concrete pile may resist axial loads like a 5000 or 6000 psi concrete pile depending on the number of wraps and the confining pressure the jacket places on the pile. PileMedic® requires no hoop steel reinforcing and the annular space is determined by spacers that get wrapped directly onto the host pile. These spacers are designed to minimize the annular space thus reducing dead load, materials and construction time.